Whether to set fireworks to music should reflect the nature of the event and the location.There is no doubt that setting Fireworks to Music together in the right combination can result in an experience far greater than the sum of the two ingredient parts. The correct choice of music is the simplest way to theme a display to a particular subject. and the skill of the display designer is then to select and use fireworks in a complementary, visually exciting and artistic way.Using bespoke computer software our display designer analyses the music file and places firework cues wherever desired. The software and our extensive product database accounts for the “pre fire time” from firework launch to explosion and advances the cues automatically. A display designed or performed badly to music may be worse than not having music at all. With manual lighting techniques there is little or no chance of achieving any real synchronisation between the fireworks and the music. Electronic control is now the only acceptable method for launching Fireworks to Music for professional display companies. Fortunately Merlin are recognised in their ability to create the perfect match between music and effects. Using their experience, boundless creativity, a little magic and a state of the art electronic control system, Merlin can create and present a precision display of choreographed and synchronised fireworks to music. 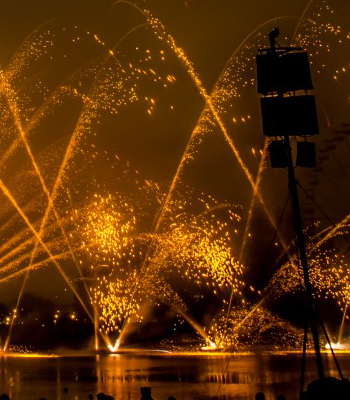 Merlin has participated in some of the Worlds most prestigious International Musical Firework Competitions using Merlin’s “Smartfire” system, one of the most powerful digital firing systems specifically designed to set and fire fireworks to music in perfect synchronisation. Working to live music is the ultimate challenge as the live performance invariably moves faster than any rehearsal and the Fireworks have to launch ahead of the music to give them time to ascend before they burst on a note. Fortunately Merlin have a wealth of experience of firing to live music. We have accompanied Solo artists, Groups, Military & Royal Marine Bands and full concert Orchestras. Whatever the occasion why not ask Merlin Fireworks to create a spectacular Symphony of Fire for your next event.